The Bundesliga hasn’t been in better health both on and off the pitch, with a title race for the ages unfolding between reigning champions FC Bayern München and Borussia Dortmund coinciding with the DFL (Deutsche Fußball Liga) announcing record revenues in its annual Economic Report. 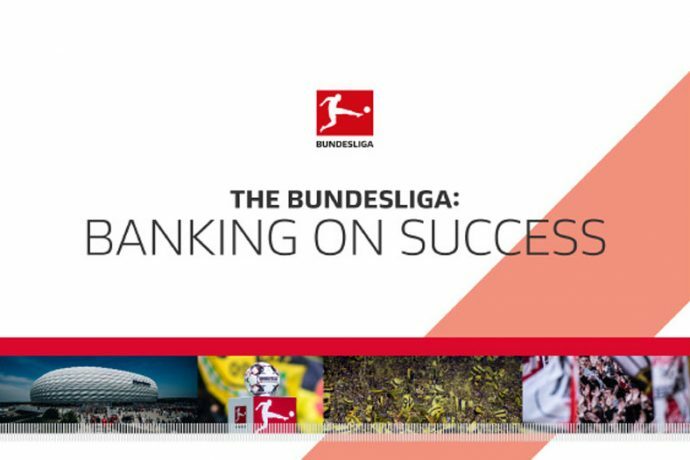 It continues a year-on-year trend for the DFL, that has seen both the Bundesliga and Bundesliga 2 increase revenues for 14 successive years. At the heart of this remarkable success are the league’s fans, who remain the most passionate in Europe and continue to turn out in their droves up and down the country. Last season alone, nearly 19 million tickets were sold for Bundesliga and Bundesliga 2 matches. 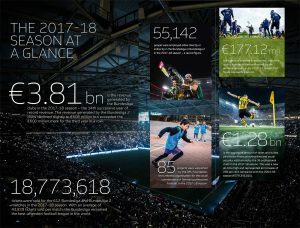 On average, more than 43,000 fans have attended every Bundesliga match in 2018/19 and those swathes of supporters have fed back financially into each and every club to help make the Bundesliga the second biggest football league in the world in terms of revenue and the sixth biggest sports league globally. 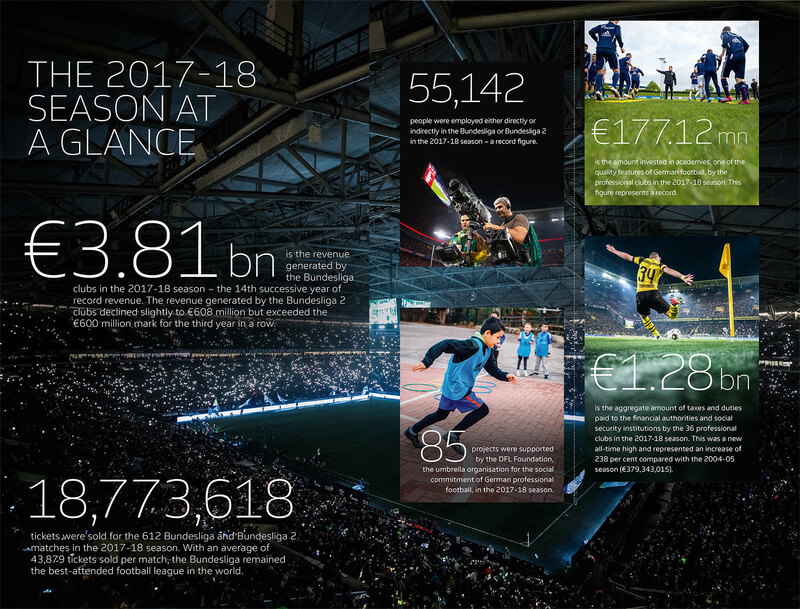 In all, the DFL registered an overall turnover of €4.42 billion (Bundesliga €3.81bn, Bundesliga 2 €608 million) across the 2017/18 season, with 17 of the top flight’s 18 clubs all generating revenues of more than €100m last term. Collectively, the 18 Bundesliga clubs increased their revenue by €438.5 million during this period. Add that to 10% annual growth from the 2016-17 season, plus the fact that revenues have doubled in the last seven years, and the Bundesliga one of the most financially healthy leagues in the world. This growth has been reflected in the DFL’s own expansion which now sees seven subsidiary companies sit under its umbrella. Notably, the DFL Foundation – the charitable arm of the DFL that carries out a number of social projects across Germany – moves from strength to strength. Since 2008 the DFL Foundation has supported more than 470 projects and spent €21,5 million on its social commitment, focusing on the promotion of healthy and active lifestyles amongst children and adolescents and supporting talent from 50 different Olympic and Paralympic sports. DFL Digital Sports and Bundesliga International are also playing pivotal roles in the DFL’s efforts to grow the league internationally, with digitalisation at its core. “Digitalisation and globalisation will open up new opportunities for German professional football in the coming years,” said DFL CEO Christian Seifert. That focus on taking the Bundesliga into new territories has seen the league establish its second office in Asia with the recent opening of satellite Bundesliga headquarters in Beijing. This adds to the Singapore office already established and follows on from the league’s similar move into New York last year, as well as the strategic partnership with IMG Reliance that has seen the Bundesliga also build a presence in India. The China announcement came with news that the league would also roll out localised digital campaigns across the country and build on its already 2.6m strong followers on Weibo by launching its own channel on Jinri Toutiao, further establishing the importance DFL places on digital. And the expansion beyond Germany’s borders continues to pay dividends back home. By the end of the 2017-18 season, the 36 clubs and limited companies of the Bundesliga and Bundesliga 2 made a record payment of taxes and duties to the state. That was thanks to a whopping €1.28bn fiscal contribution that included social security and accident insurance. Not only that, but across the Bundesliga and Bundesliga 2, a total of 55,142 people were employed by clubs and their subsidiaries; an all-time high for employment within German professional football. Record revenues, enormous attendance figures, the breaking of new global markets, record employment and financial growth benefiting the league, its clubs and Germany as a whole all make for great reading. And with only one point separating the top two with only six games to go, despite last Saturday’s game between the title chasers, we’ve seen one of the most competitive campaigns in Bundesliga history. There’s certainly plenty of reasons to cheer. The future’s bright; the future’s Bundesliga! This is Football As It’s Meant To Be.